All of those factors makes them relevant countries to study. The research, however, doesn’t include other developed liberal democracies, which most closely resemble the United States. So the exact place of the US within the global landscape isn’t clear. The reason so few countries were examined is that the researchers put so much effort into the countries they did look at. 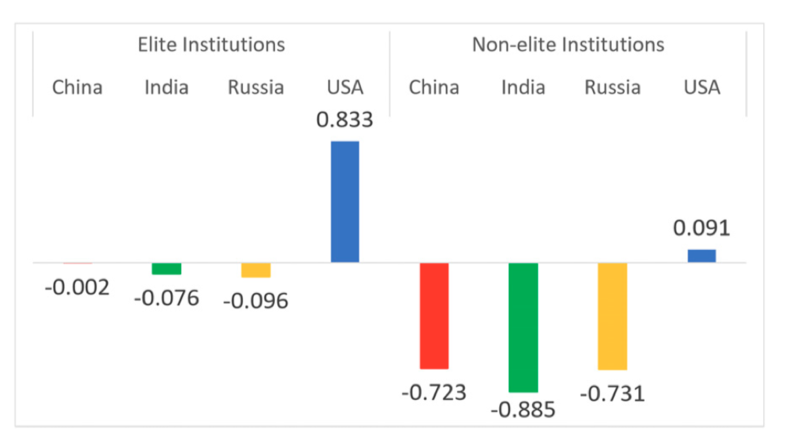 For the three countries, the researchers identified a total of 85 schools, a random mix of elite and less-than-elite schools. At these schools, they got students in their final year of a computer science undergraduate program to sit for a two-hour exam. The exam was translated into the local language and based on materials from the company responsible for administering the GRE tests used for graduate school admissions. All told, 678 Chinese students, 364 Indians, and 551 Russians took the exam. One concern here is that the US is benefitting from getting some of the best foreign students, who inflate its scores. But the researchers corrected for this by separating out anyone who didn’t list English as their native language; the gap was unaffected. In addition to the above caveat regarding the countries chosen for this analysis, there’s the issue of the tests themselves. The authors took great pains to ensure the translation of the test materials are top-notch. But the test questions themselves are focused on the US education system, as the GRE questions are designed based on surveys of US graduate and undergraduate programs. Thus, there’s a chance that some of these questions are skewed to favor the products of the US education system. The fact that Chinese, Indian, and Russian students all performed at similar level, however, suggests this probably wasn’t a major issue. All told, the US produces about 65,000 students with computer science degrees each year, a number that’s gone up dramatically over the past few decades. That number is dwarfed by either China (185,000 students) or India (215,000 students). But the new research suggests those students are extremely well-prepared compared to those in other countries.